A middle-aged violinist (Claude Rains) secretly funds the voice lessons of a beautiful young understudy (Susanna Foster) at the Paris Opera. When he is dismissed from his job, Rains tries to earn money to continue Foster’s lessons by selling a concerto he’s composed, but is disfigured by acid when, in a fit of rage, he kills the man who he believes has stolen his work. He escapes from the police and goes underground at the opera house, determined to make Foster a star at any cost. Universal Pictures’ remake of its own silent-era horror classic is an entirely different cinematic experience altogether — one which, unfortunately, can’t hold a candle to its atmospheric predecessor. As noted in Richard Schreib’s review of the 1925 Lon Chaney version, that film’s director “keeps the character of the Phantom deliberately mysterious –- as opposed to [in] other versions” (such as this one), “which create too much sympathy and not enough mystery for the Phantom.” Indeed, this later version is less a supernatural horror film than an operatic love triangle underscored by a tragic character study — a messy melange of genres which never really gel. 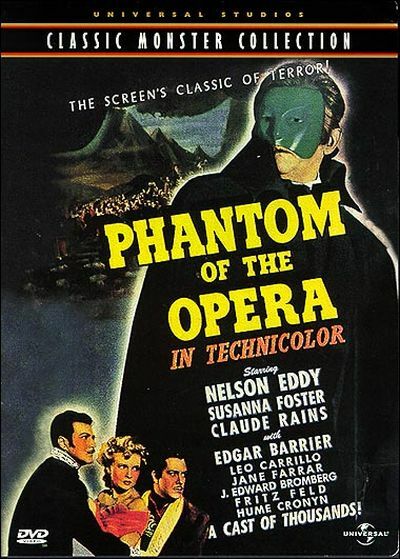 In a significant departure from the original novel by Gaston Leroux, the first half-hour or so is given over to providing a back-story for the Phantom, who turns out to be a reasonably sympathetic, if deeply disturbed, violinist who, for reasons left frustratingly opaque — is he her father? (in the original novel, her father is a deceased fiddler) — holds a lifelong obsession with making Christine (Foster) a star. Rains is as compelling to watch as always, but — despite the clear effort made to flesh out his character — his Phantom feels “unfinished” somehow; it’s almost as though, in their attempt to humanize the Phantom, the filmmakers stripped him of his mystery while unintentionally opening up a host of other unanswered questions. Meanwhile, as noted in Time Out’s review, the film is at least “very pretty to look at, with lush Technicolor, handsome sets, and even a fetchingly sculptured mask to give Claude Rains’ rather benign Phantom the look of a contented feline.” However, the “endless operatic snippets for Eddy and Foster to warble [make] it all a somewhat tiresome waste of Rains’ performance.” In addition, while there was a clear romantic rival for the Phantom’s affections in the original film, here this element of the plot has been needlessly opened up to include a pair of “humorously” rivalrous suitors for Foster — not just policeman Raoul D’Aubert (Edgar Barrier), but tenor Anatole Garron (Nelson Eddy) as well (presumably because Rains, as hinted above, never posits overtly romantic yearnings towards Christine). Foster is charming in her way (and certainly beautiful), but Barrier and Eddy are simply insipid male co-leads. 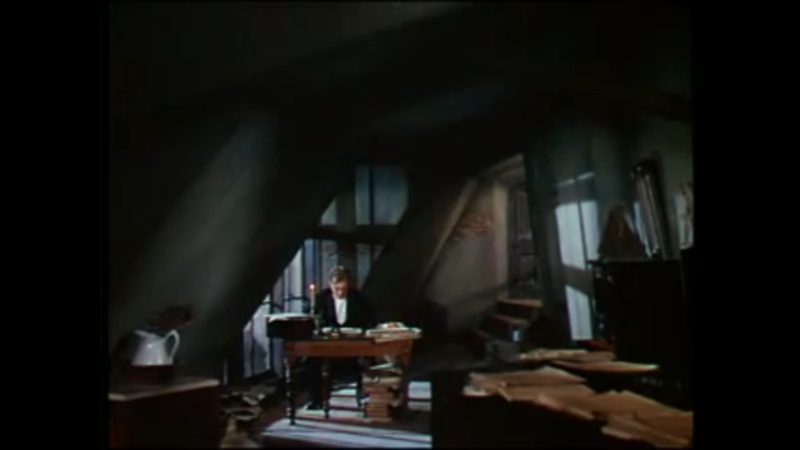 Other than Rains’ performance, the best element of the film by far are its reasonably atmospheric sets, including the use of the same Paris Opera House replica that appears in the original silent version. Note: Click here to read a list of the dozens of multi-media adaptations (so far) of Phantom… — a story which clearly resonates on an archetypal level for many. No; this one is only must-see for true Phantom-philes. First viewing. Not must-see, but not an uninteresting version of the Phantom tale. I’m rather surprised to learn of the exact number of film variations there have been on this story. It mostly surprises me because this is a story that holds little interest for me personally – and its strong appeal eludes me somewhat. Still, there can be a difference between what a story is and how it is told. Lon Chaney makes the silent version memorable. De Palma’s pop-rock cult classic has its pleasures. And the film of the Andrew Lloyd Webber musical is…horrendous, to say the least. 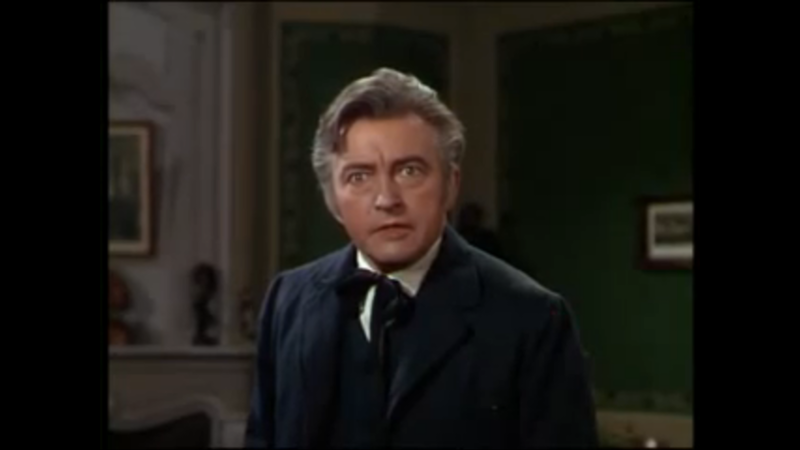 As far as this version with Claude Rains goes, some of what is brought out in the assessment is true. Because of how Rains’ character is set up, it’s a bit awkward when he suddenly turns homicidal, for example. His character does seem “unfinished”. I don’t mind the extent that opera is brought to the forefront here. I’m not an opera fan but, as used here in context, I found it enjoyable. I didn’t particularly think Christine’s suitors were “insipid”; I thought they were used well to counter the more tense elements and appreciated the bit of humor they bring. Overall, with this version, the story itself, to me, seems secondary to the way it has been produced. Thanks even more to the blu-ray version that I just watched, it is indeed lovely to look at (and so tasteful that, at first, I mistook its director Arthur Lubin for Arthur Lewin – who brought such a similar refined sensibility to ‘The Picture of Dorian Gray’, ‘Pandora and the Flying Dutchman’, etc.). So it’s serviceable as a diversion, and more than reasonably intelligent (if slightly flawed).